How long will my Workers' Compensation benefits last in Iowa? How long will my Newton Workers' Compensation benefits last? Under Iowa law, Workers' Compensation benefits will last until you return to work or 30 days after your employer notifies you that benefits will be ending. For workers in Newton, a Workers’ Compensation lawyer may be able to help with reinstating your benefits. If you receive notice from your employer that your Workers’ Compensation benefits are coming to an end, an explanation must be included. By law, an Iowa employer is required to explain the reason for the change and provide you with information on filing a claim with the Workers’ Compensation Commissioner. A dispute regarding a workers’ comp claim may usually be resolved if you and your lawyer discuss the circumstances with your employer and its insurance carrier. However, if issues persist, contact may need to be made with the Iowa Workers’ Compensation Commissioner’s Office. You or your attorney will need to speak with the Workers’ Compensation Compliance Administrator to discuss the matter further. Disagreements that cannot be resolved at this level will require you file a contestable case. The case will go before the Iowa Workers’ Compensation Commissioner, who will make a ruling on your claim. Issues with your workers’ comp benefits may require the skills of a knowledgeable Newton Workers’ Compensation lawyer. The attorneys at Walker, Billingsley & Bair understand the Iowa workers’ compensation system and can help you make informed decisions. 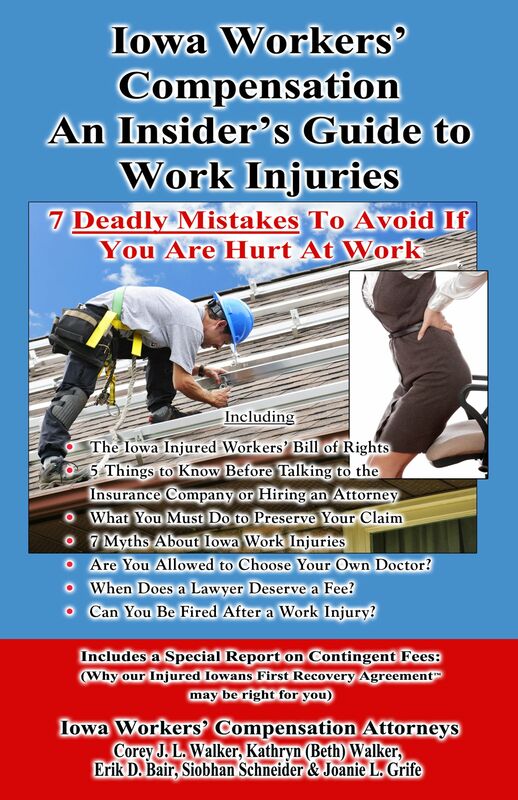 Request a copy of their free book Iowa Workers’ Compensation – An Insider’s Guide to Work Injuries: 7 Deadly Mistakes To Avoid If You Are Hurt At Work to learn more about workers’ compensation in the state. Call today at 1-888-435-9886.